The following is a helpful visual to show the bail out needs to fund the upcoming bankrupcy of Ireland, Portugal, and Spain, which I discussed in detail on Wednesday. 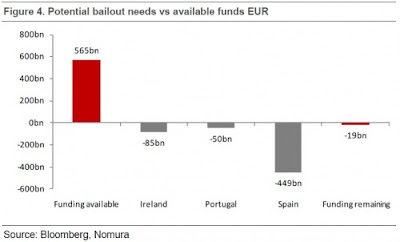 Under the current size of the EFSF (which is the European bail out fund, similar to the TARP bail out fund created in America) they have 565 billion euros still available. "It should be easy to convince markets with the EFSF backstop that speculation against governments will not be successful. The facility provides for up to E440 billion in government-guaranteed loans, which is in addition to a pre-existing E60 billion EU emergency fund. The IMF has also pledged up to E250 billion, bringing the total pot to E750 billion. Weber said he was convinced that if the E750 billion is not enough, Europe's political leaders "will do more." Translation: If the European leaders do not have the political will to bail out everyone, or if it is just simply not possible with the funds available, the European Central Bank stands ready to print. Gold continues to peer on at these events with a watchful eye.